WILMINGTON, N.C.—October 23, 2013 Newly released real estate agent marketing service, XiLi Mobile is changing the way people buy homes and realtors get leads – all with one text message. XiLi automatically connects homebuyers and listing agents through text messaging, making home shopping easier for buyers and lead capture more successful for agents. Homebuyers simply text “XiLi” to 86789 on any browser-enabled smartphone to instantly receive a custom mobile link with listing information based on GPS location. When the buyer clicks on a property, his or her mobile number is simultaneously sent to the listing agent, who can then text the buyer and offer additional information or a property showing. Collaborative research conducted by Google and National Association of Realtors found that 89 percent of new home shoppers utilize mobile search throughout their house hunt. XiLi meets modern buyers’ demands for mobile solutions, while giving real estate agencies the tools to more effectively communicate with buyers. Additionally, XiLi’s technology better allows agents to generate and track real estate leads. XiLi Mobile captures interested buyer information allowing agents to respond and create immediate dialogue – something that cannot be done with QR codes, flyers or websites. “As a broker, having an easy and affordable way to connect homebuyers with our listing agents allows us to better serve our customers and do what we love most – selling dream homes,” said Tim Milam, president, Coldwell Banker® Sea Coast Advantage, the fourth largest Coldwell Banker in the country in terms of commissioned sales. For $9.99 per listing agent per month, XiLi enhances agents’ current mobile technology investments, creating a valuable new approach to attract hot, qualified real estate leads. XiLi’s database uses MLS listings to deliver free, up-to-date information to homebuyers throughout the United States. To use this real estate agent marketing service, buyers simply text “XiLi” to 86789. Agents can subscribe through the XiLi Mobile website. It takes about ten minutes to sign up for the service and requires no further data entry or maintenance by agents. Developed by TextThisHouse, LLC, XiLi Mobile is a mobile marketing solution designed to quickly connect homebuyers to agents in real-time. XiLi’s database uses MLS listings from across the nation to provide information about available homes to interested buyers via text message, while simultaneously capturing these leads and automatically forwarding them to the listing agent for contact. For more information, visit www.myxilimobile.com. PreviousFree Report! Top 10 Ways to Reduce Your Rental Property Insurance Costs! 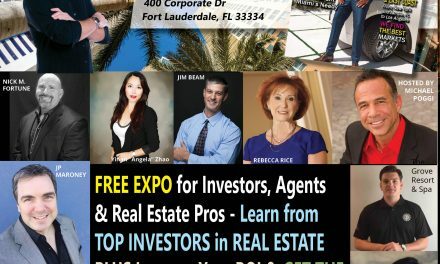 Did You RSVP for Our Florida Event to Celebrate Our Real Estate Wealth Edition? DO IT HERE!